The Scientific Review of Mental Health Practice applies the best tools of science and reason to objectively evaluate novel, controversial, and untested mental health claims. Our purview includes claims regarding the efficacy of psychotherapies and self-enhancement methods, the validity of assessment instruments, and the scientific evidence for psychiatric diagnoses. We will reject no claims out of hand or prior to scientific scrutiny, although we will subject all claims to careful investigation and analysis. 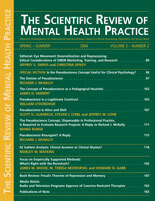 The publication of SRMHP has been endorsed by the Commission for Scientific Medicine and Mental Health, a panel that includes prominent psychologists, psychiatrists, social workers, and Nobel prizewinners.